Odisha PSC Department will conduct the written exam for 230 post. Candidates who are going to attend for Odisha PSC Post Graduate Teacher Exam can view the OPSC Syllabus & Odisha PSC Exam Pattern given here. Department has already published the official notification for 230 PGT (Post Graduate Teacher) Vacancy. Candidates if still you have not applied for this exam then apply online . Download OPSC Post Graduate Teacher Exam Pattern from the below sections. The race to get the government job is increasing rapidly. As the competition is high and the exams are getting tough day by day Aspirants should need a perfect planning and preparation to get through the exams. Without following any path or strategy no one can help in clearing the exam. 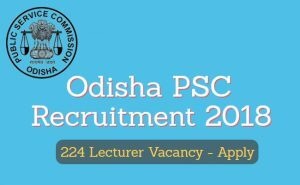 Candidates who have applied for these Post Graduate Teacher jobs will be searching for the OPSC PGT Syllabus and Exam Pattern & Odisha PSC PGT Exam Pattern and they can visit our website to get the valuable information. Department will organize written examination for recruiting applicants on PGT Vacancy. Applicant selection for Odisha PGT Jobs process, shall be done on the basis of the & Written Examination. Registered applicants who want to appear in OPSC Competitive Exam scheduled Released the Examination nature will be objective type. Final Selection of the applicants will be based on Marks consist in written Examination & viva voce test. The written exam will be consist of some subject as General English, General Knowledge, Computer Aptitude, Pedagogy. The exam will be consist of objective type question and multiple choice question. Paper will consist 150 Question and 150 Marks, each correct question get 1 marks. Paper duration will be 3 hours. Part B. ( Concerned Subject) consists 100 marks & 100 question form the concerned subject in applicant complete the post-graduation. Basics of Hardware and software, Windows operating system basics, Internet terms and services, Basic Functionalities of MS-Office (MS-word, MS-Excel, MS-PowerPoint), History of computers, Networking and communication, Database basics, Basics of Hacking, Security Tools and Viruses. Hope that candidates make good preparation for the exam. We know that they need the exam syllabus and pattern which helps the candidates in the exam preparation.